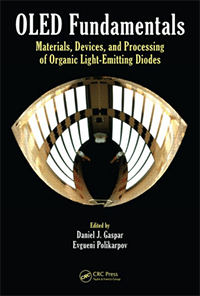 Pacific Northwest National Laboratory researchers Dan Gaspar and Evgueni Polikarpov have edited a new book on the energy-efficient lighting technology known as organic light-emitting diodes, or OLEDs. They also wrote a few chapters, while prominent researchers from universities, industry and PNNL wrote the rest. The other PNNL chapter authors are David Gotthold and Asanga Padmaperuma. OLEDs are thin, flexible lights that provide vivid colors. They've become popular for displays in hand-held devices. OLEDs are also in high-end televisions and light bulbs. The 504-page book, titled "OLED Fundamentals: Materials, Devices, and Processing of Organic Light-Emitting Diodes," offers a broad and technical explanation of how OLEDs work, practical considerations for real-world manufacturing, and recent advances that made the technology popular for lighting and displays. The book specifically focuses on the small-molecule variety of OLEDs and is geared toward researchers and advanced students. CRC Press released the book June 11 - the book's list price is $149.95.